This is a project that I originally started many years ago. I tried to build the oscillator according to Aaron Cake's schematic, but since I didn't know much about electronics when I started this project, I gave up because I couldn't get it to work. I tried to build a 555 timer version of a jammer, and that didn't work out too well either. I was able to get a 38kHz frequency going, but it would not jam my remotes. I scrapped that idea even after I had completely written the tutorial to build it. The upside of a 555 is that it is easily programmed with discrete components. Anyone can do that in their own home without expensive compilers. Some folks have said in other forums that the IR jammer is banned by the FCC. If that were the case, the FCC wouldn't even allow you to use a flashlight without obtaining a license. And if you have a tv that was ruined by a stream of IR flashes, I really want to see it duplicated. For the purposes of jamming your own television this circuit is completely legal. Uses other than messing with your own home equipment may or may not be legal. If you use this on a Sony device, you'll probably be sued. I built my circuit on a one-sided printed circuit board. Using perfboard or any other prototyping board is completely acceptable. Just be sure to use an IC socket so that you can remove your chip and reprogram it later if you decide to change something. If you decide to use perfboard, follow the schematic and mark off the connections as you make them. If you prefer to make a circuit board, the mask is included in the PDF file below. The initial test was limited to 6 feet from the television because of the programming cable length. I used USB power and the Pickit2 programmer to test this circuit. It worked with both 45 degree and 18 degree LEDs. [The 45 degree is from Radio Shack and the 18 degree is from Digikey.] I plan on using one 18 degree and two 45 degree IR LEDs. 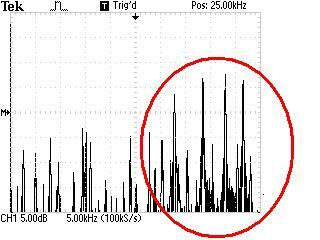 You can see the four frequencies in the Fast Fourier Transform that I did on my Tektronix oscilloscope. I have 33kHz, 38kHz, 43kHz, and 48kHz. Those are rounded off numbers. The instructions were running at an average of .9uS per instruction. The estimated rate was 1uS each, so the programs ran a little faster than expected. This is ok because the receivers have a range of plus or minus a few kilohertz. They operate like a bandpass filter, so you won't need exact frequencies to get it to work. ###The actual breadboard/assembly steps are excluded, with the exception of the Fritz. I usually do not include step-by-step circuit assembly instructions since I believe that reading a schematic gives you creative flexibility. Everything is flexible in this project. You could choose to use two AA batteries or you could regulate a 9V. You can modify the circuit to use transistors to boost the power to the LEDs. You can use a bigger box, a smaller box, or just use no box at all. Finally, you have access to my programming files so you can change it and make your own. This is how I made mine. Your mileage may vary (YMMV). Copy the program files (either C or ASM) to MPLAB. Compile and program the IC. Assemble and test on a solderless breadboard. If you are ready to make it permanent, skip to #2. Find a spot in your box to mount the circuit board. You can either hot glue the board in for final installation or you can measure and drill holes in your circuit board to mount it using screws. I chose to use screws in case something breaks later on. We will come back to the box in a little while. Using the area inside the box, design the dimensions of the circuit board so that it will fit nicely and still leave room for the power switch. Solder the power wire from the circuit board to one tab of the SPST switch. Connect the red wire from the battery pack to the other tab of the switch. Take a break...actually this was a step from the first tutorial I wrote...If you look at the pictures in step 6, you'll see the first experiments in IR jamming. Fortunately, the check for LED fit still applies. Do another dry fit of the circuit board and estimate where the LEDs will protrude through the box. Mark the locations of the LEDs on the box so that you can drill the holes for the LEDs. If the hole elevation is off a little the LEDs can bend some to fall in their final position. (I used a caliper and measured the depth of the pcb and made points on the outside of the box. Then I drew a line. Finally, I made points and center punched them once they looked right. Check and double check.) Once you mark where the holes will protrude, drill the holes. Find a good spot on the box that does not interfere with the circuit board, batteries, and LEDs to mount the power switch. My box is big enough to mount a large switch on the top of the box. Again, you'll want to check and recheck this. Nothing is more aggravating than having a box with mystery holes drilled in it. Once you verify that the pot and switch will fit, measure out the hole positions, check, and drill them. Check the LED positions again then Solder the LEDs in position on your circuit board. I bent the leads of the LEDs using pliers to get a uniform bend. Be sure that you did a good check in step 6 to ensure a good fit in the holes. By this time your circuit board should be completely assembled. Before installing the circuit board, ensure that it works!!! If it works, mount the circuit board and LEDs into the box. Two #4 screws should do the trick. Install the power switch in the hole. Hot glue the battery pack to the lid of the box. Close the box using the screws that came with it. You are now ready to jam. irjammer.c - not as complete as the Assembly program, but you can copy the missing pieces from the Assembly program over if you'd like. Remote Jammer Board PDF - For reference only...not for creating PCBs (use the Eagle file for that. Remote Jammer Board BRD - Eagle board file...There are two versions. The original version and a version with a transistor to boost power to two IR LEDs.